According to the company, its new UHD interactive flat panel Premium RP series offers "classroom-ready" features and a user-friendly interface. The 4K IFP family includes the 65-inch RP6501K, 75-inch RP7501K and 86-inch RP8601K. When combined with BenQ's EZWrite 5.0 software, the IFP becomes a collaborative hub, allowing users to share ideas, notes and opinions and make annotations on screen captures from apps, video, websites, documents and images. Participants can also annotate on the screen from their devices, regardless of their location. Instrutors can download and upload files from the screen to cloud services, such as Google Drive and Dropbox, eliminating the need to use a USB drive for accessing files. Voice Assistant, to let instructors control the flow of the class, such as starting the timer or searching the internet from wherever they are in the classroom. Faculty members can run the IFP through voice control or remote control. "Educators have a huge responsibility to use technology in a way that will spark new aptitudes in learning. However, many solutions available are cumbersome to operate, time-consuming to develop content with and can be unhealthy with prolonged use," said Bob Wudeck, senior director, business, education and CinePro solutions, in a statement. "BenQ is the first display company to prioritize healthy learning with thoughtful features that make the display intuitive and help teachers easily achieve goals." 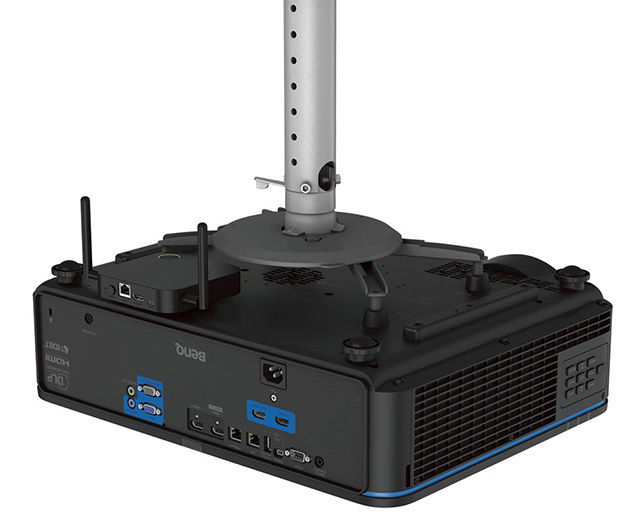 The company also announced two 4K laser projectors that are designed to support 4K high-dynamic range imaging (HDR) presentations in huddle rooms and collaborative spaces. BenQ's upcoming LK952 and short-throw LK953ST 4K ultra-high-definition HDR projectors produce 3840 x 2160 resolution with 8.3 million distinct pixels for each frame. The projectors generate 5,000 lumens of laser-powered brightness for 20,000 hours. The company said the new devices use technology for delivering "awe-inspiring clarity" and "crisply defined details" for which Apple's iOS and high-end 4K notebooks are known. Image-amplifying functionality further enhances the quality of projected images, including detecting changes in the color between an object and its background to produce sharper edges and more precise surface textures. Flexible installation for projection onto ceilings, walls, floors or angled signage, with horizontal and vertical lens shift and 360-degree rotation. "BenQ's LK Series laser projectors leverage technology engineered for our gaming monitors to support true 4K HDR output," said Wudeck. "For the first time, users can see that same arresting quality, revealing the fine details within complex spreadsheets and graphical content in perfect clarity and alignment. The result are images that pop with all the nuances you don't want to get lost."